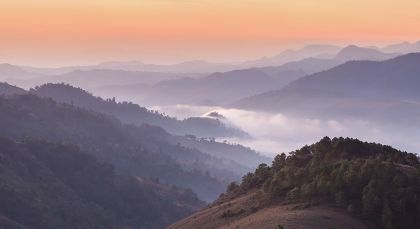 Travel to Myanmar now to discover a place with untouched charm! This tour takes you throughout the country, where you will find a unique culture steeped in history and native wisdom. Relax in a fishing village, at a hill station renowned for treks and on a glittering beach! Naypyidaw, meaning ‘abode of the king’, is the capital city of Myanmar, formerly Burma. 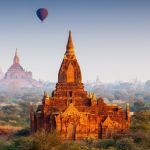 Discover the road to Mandalay! 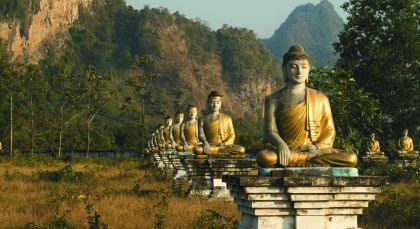 Enjoy an hour’s private ferry boat ride before disembarking on the western banks of Ayeyarwaddy to see Buddhist shrines and meditation centers. 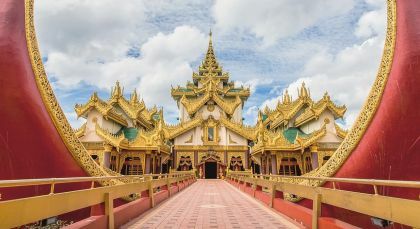 Discover Mingun Pahtodawgyi, the world’s largest incomplete pagoda that would easily rival the Great Pyramid of Giza if it had been completed. 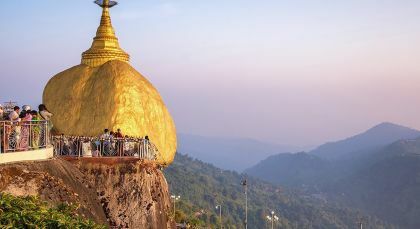 Observe Mingun Bell, the world’s largest uncracked bronze ringing bell, cased in 1808 AD, and Mya Theindan Pagoda built in memory of King Bagyidaw’s favorite wife. Take a horse-drawn carriage ride to Nan Myint Watch Tower, the Maha Aung Mye Bon Zan Monastery, and Babaya Kyaung Monastery. Your final stop is the Mingun Home for the Aged, founded in 1915 by Daw Oo Zun. The return boat to Mandalay is downriver, taking just 40 minutes. To respect local customs, please dress conservatively and be sure to bring sun lotion and sunglasses with you. Kindly note that footwear is not permitted within the main temples. 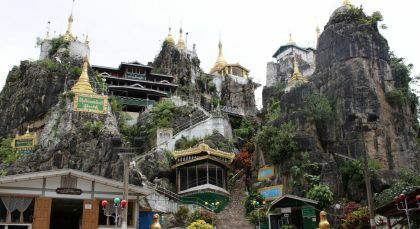 Enjoy a full day trip to Mingun, Schwebo and Kyauk Myaung. You will be fetched from your hotel around 0700 hrs and transferred to the jetty for a morning excursion by private boat. 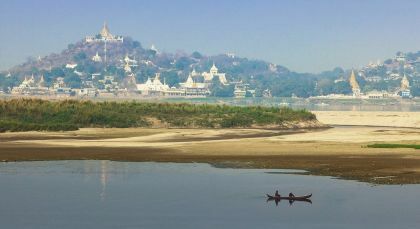 The one hour boat ride takes you 11 kms upriver from Mandalay to the western banks of the Ayeyarwady river where you can observe abundant river life. 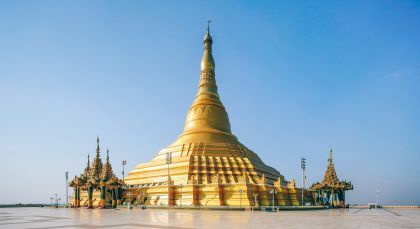 See Mingun Paya (Mingun Pahtodawgyi), a huge unfinished pagoda; the 90 ton Mingun Bell, until 2000 AD, the world’s largest un-cracked bell; Mya Theindan Pagoda or Hsinbyume Pagoda, built 1816, highlighted by its unusual, striking architecture. Visit the Home for the Aged, the first of its kind established in Myanmar by Daw Oo Zun. Continue driving about 3.5 hours to Kyauk Myaung, stopping en route for a simple lunch at Shwebo. Kyauk Myaung, a riverside town on the Ayeyarwady, is famous for glazed pottery works – toys, cups, letters, bowls, pots, and huge water jars tied in hundreds and floated downriver as rafts. Visit a pottery workshop, heading to the Irrawaddy riverbank to see how the pots are transported downriver. Drive back to Mandalay (about three hours), reaching around 1800 hrs. Enchanting Travel’s were brilliant. Everything went smoothly from the moment we woke up and started our day til the moment we went back to the hotel of their choice. Everything was stress free and enjoyable.